Kids are playing outside less and less as time goes on, as a new Kelton Research survey reveals: Kids today have eight hours less per week of outdoor playtime than their parents did. Overall kids today spend 56% more time in front of screens than they do playing outside. 96% of parents report their kids have experience playing video games, while only 61%-74% of parents say that their children have visited a national or state park or gone hiking. And most parents say 13 hours is the ideal amount of outdoor play per week but parents also admitted that their kids spend about 14 hours in front of a screen, and just nine hours engaged in outdoor play each week. CLIF Kid, maker of certified organic snacks for active kids, in collaboration with Richard Louv, best selling author of Last Child in the Woods: Saving Our Children from Nature Deficit Disorder, aim to change some of these sobering statistics with the launch of CLIF Kid’s 2nd Annual Backyard Game of the Year Contest. Keep reading to learn more about this creative contest, including the cool prizes your child may win, plus see the game invented by last year’s winner. 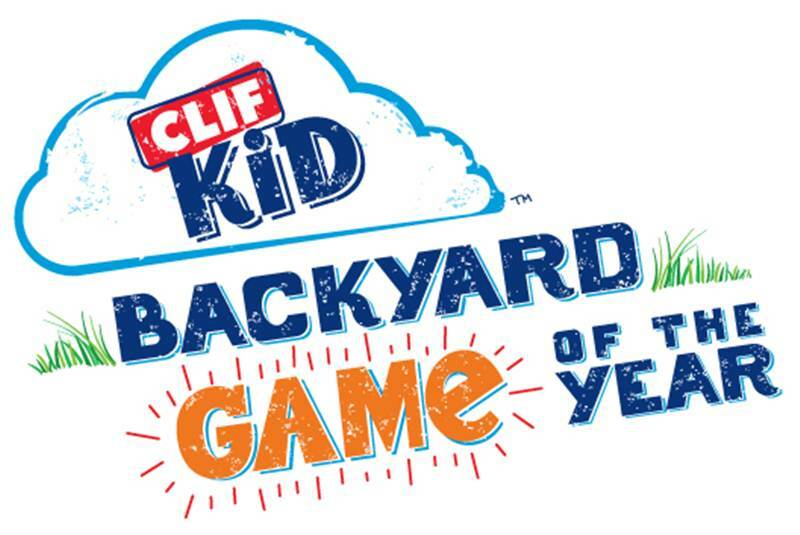 The CLIF Kid Backyard Game of the Year contest is designed to get kids outside and active. 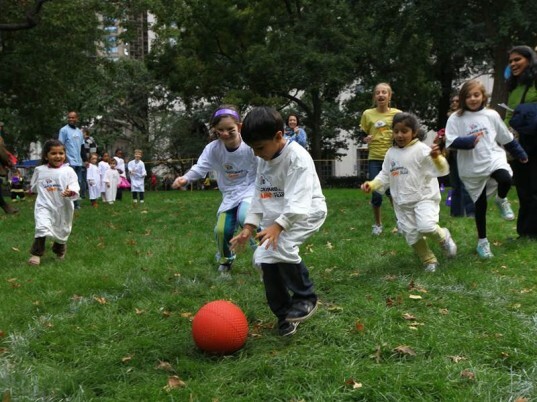 This year Richard Louv will serve as Chief Outdoor Officer for the 2012 Backyard Game of the Year Contest and Playoffs and Louv notes, “Kids are healthier, happier and more creative when they spend more time outdoors. I’m excited to be a partner with CLIF Kid in its terrific effort to encourage kids and their families to reconnect with nature and invent their own games — beginning in their own backyards.” Louv and CLIF Kids are on the right track. As you saw in the research above, kids are lacking outdoor playtime, which is not only detrimental to their physical health, but their emotional well-being too. The benefits of outdoor play are far reaching and include lower obesity rates, less stress, reduced ADHD symptoms and many other perks. Plus, playing outside is just plain fun – our generation knew this growing up and our kids should be allowed to know this as well. This contest encourage kids ages 6-12 to use their imaginations and reconnect with outdoor playtime by inventing their very own backyard game idea. Any creative outdoor game may be entered, but the game must allow at least two kids to play together. 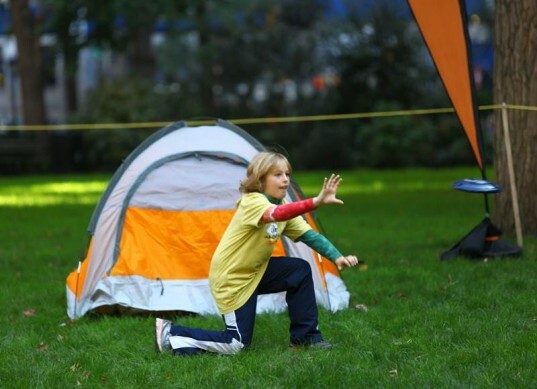 Games can utilize common household items such as balls, hula hoops or beanbags. Games will be voted on and this year six finalists will be chosen. All six finalists will win a Marin bicycle and Bell helmet plus a trip to San Francisco to compete in the CLIF Kid Backyard Game of the Year Playoffs in July 2012. To top off the games, the five runners-up will each win a $1,000 scholarship and the grand prize winner will receive a $10,000 educational scholarship. Plus, the winning game rules and equipment will be donated to Children & Nature Network, a non-profit organization, co-founded by Richard Louv to reconnect kids with nature. All entries must be received by June 17, 2012. See the official rules. Last year’s winning game was invented by nine-year-old Sara of Plaistow, New Hampshire and is made for two or more kiddos to play. All you need are 2 sponge balls per child, 1 large water bucket (about 5 gallons) and 2 smaller buckets (about 1 gallon each). Oh, and if you’re wondering what a sponge ball is, you need to cut two sponges, width wise, to create five strips per sponge for a total of ten strips. Then simply hold all eight strips in a bundle and tie them tightly with a two-inch piece of elastic twine. Then fan out the strips to create a ball shape. Below is how to play this winning outdoor game. Create two Sponge Balls per kid based on the instructions above. Fill your biggest household bucket with water and place it on the lawn. Set two smaller buckets on the opposite side of the lawn. Split kids into two teams and when you say “GO!”, have all the kids run to the water bucket and grab two soaked Sponge Balls. 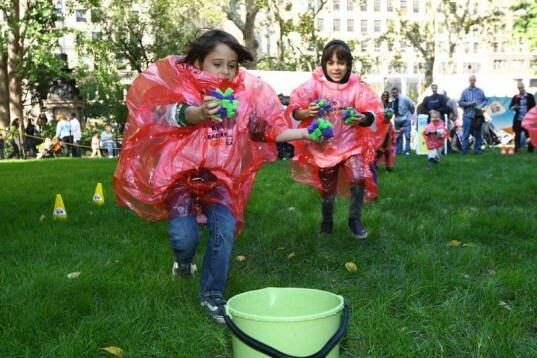 After grabbing two sponge balls, the kids have to use the water in the Sponge Balls to fill up their team’s bucket on the opposite side of the lawn, running back and forth from their team’s bucket to the water bucket as many times as needed. Bonus play: Kids can capture Sponge Balls from the other team by throwing their Sponge Balls at them. If a kid hits a member of the opposite team with their Sponge Ball, the kid from the opposite team must hand over one of their Sponge Balls. The kid, who now has three Sponge Balls, can squeeze the water from all three into his team’s bucket. The kid left with one Sponge Ball can still run to their team bucket to empty the water in. Upon return to the water bucket, each kid can only leave with two Sponge Balls, leaving extras behind or grabbing replacement Sponge Balls as necessary. How to win: The first team to fill their bucket wins! + Thanks to CLIF Kid for the awesome game instructions. Kids are playing outside less and less as time goes on, as a new Kelton Research survey reveals:�Kids today have eight hours less per week of outdoor playtime than their parents did.�Overall kids today spend 56% more time in front of screens than they do playing outside.�96% of parents report their kids have experience playing video games, while only 61%-74% of parents say that their children have visited a national or state park or gone hiking. And most parents say 13 hours is the ideal amount of outdoor play per week but parents also admitted that their kids spend about 14 hours in front of a screen, and just nine hours engaged in outdoor play each week.�CLIF Kid, maker of certified organic snacks for active kids, in collaboration with Richard Louv, best selling author of Last Child in the Woods: Saving Our Children from Nature Deficit Disorder, aim to change some of these sobering statistics with the launch of CLIF Kid's 2nd Annual Backyard Game of the Year Contest. Keep reading to learn more about this creative contest, including the cool prizes your child may win, plus see the game invented by last year's winner.